Cuyahoga Community College (Tri-C) has made a big move to consolidate its campus video systems, migrating from five different solutions to one. The college is standardizing on Sonic Foundry's Mediasite platform for its lecture capture as well as centralized management of all academic video files. "Tri-C used several video solutions simultaneously before moving to Mediasite," explained Michelle Reed, online video strategist, Tri-C Online Learning and Academic Technology, in a statement. "Faculty and students were creating videos in all sorts of ways and posting them in a variety of places — YouTube, Blackboard, personal websites, etc. Plus, there was no rhyme or reason to how we were managing the videos. It was ineffective and expensive." Now faculty and students at all four Tri-C campuses can create, watch and manage videos in one place. "Mediasite allows us to consolidate our video efforts and save money. Faculty and students can create and share videos in Mediasite, and everything is available to watch in Blackboard," said Reed. "Plus, we can take the thousands of legacy videos we created using other solutions and import them into Mediasite, making them searchable and new again." The college is implementing both Mediasite room capture for traditional lectures and My Mediasite Desktop Recorder, personal capture software that faculty and students can use to create short video lectures, assignments and other learning content. 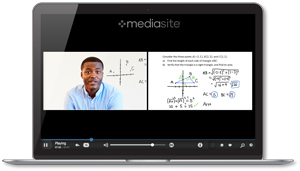 "Mediasite Desktop Recorder is a great solution to put on lab computers for students to easily record videos and share with their instructors," noted Reed. Other uses of the Mediasite system at Tri-C include providing lecture content to non-traditional students who are not able to attend class in real-time, and recording simulations to demonstrate complex procedures for studies such as nursing, radiology and emergency management.